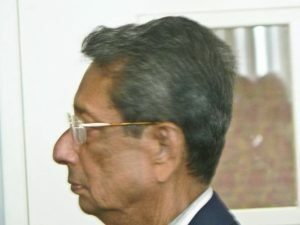 On 7 February 2017, Rathindranath Mukherjee, the eldest grandson of Jatindranath Mukherjee alias Bagha Jatin, left his physical sheath at the age of eighty-three. He was an inmate of Sri Aurobindo Ashram, Pondicherry, from 1948 to 1969 and one of those rare souls who had had the Darshan of Sri Aurobindo. An obituary of Rathindranath Mukherjee penned by his younger brother, Dr. Prithwindra Mukherjee, internationally acclaimed author and researcher, has been published in the online forum of Overman Foundation. On reaching Pondicherry at last, in 1948, we found a comfort for our soul. After a few days spent at the Ashram, coached by Sudhir Dadu (Sarkar), Rothin served us as mouthpiece and informed the Mother that we, three brothers, would like to stay there “permanently”. Promising us to think it over, the Mother waited for my mother to come for blessings. Putting her right hand on my mother’s shoulder, She told her: “The boys want to stay here. But they are so young; they require someone to look after them. Will you do it on my behalf ?” Tears of joy filled my mother’s eyes : she with my father had a dream of joining the Ashram once we were adults. The Mother was proposing to fulfill that dream earlier ! 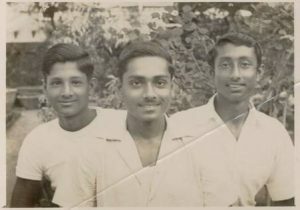 In 1948, all the three brothers, we were assembled in the transition “classe de dixième” (Class X) at the Ashram school where, with other new comers, we had lessons in French; most of the subjects were taught in French, according to the syllabus of schools in France, Pondicherry having been still the capital of French India. 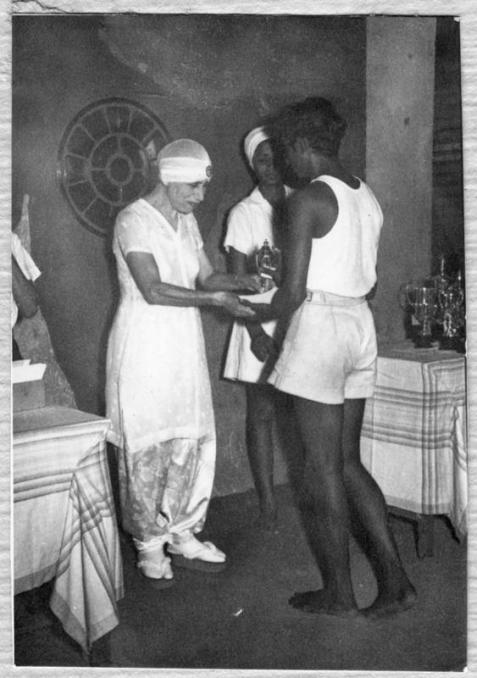 One of our teachers, Madame Gaebelé, a famous personality in French India, was renamed Suvrata by Sri Aurobindo. Generosity personified, whereas she always gave me 10,5 to 11 out of 10, Rothin had the privilege of scoring up to 14 out of 10. At the end of each class, Suvrata distributed stamps for collection and bonbons made in France. Hardly after two months of coaching in French, Rothin had a triple promotion to “classe de septième” (Class VII) in 1948-49 school year. Thanks to two consecutive double promotions, I caught him up at the “classe de sixième” (Class VI) in 1949-50. I suppose you remember how close your father and I had been. The entire picture of my life at the Ashram remains fresh and intact. Konkona informed me about your attachment to Rothinda’s memory. Thanks to the zeal of Anurâg we meet here at the Overman forum. Very moving tribute of ” Borda ” by you – Prithwinda – the beloved brother and ” Benny” has added further lustre to it by his further affectionate recollections ..
Tomar Mail peyechi.Onek ojana khobor janlam.Bisesh kore Pondicherry r prothom ta aamar ojana chilo. Bohudin Tomar Sathe samparko rahit hoe aachi.Rothin kaku r chole jaws r Sambad Bhai didi r ,Rubi,theke peyechilam kintu tomader Sathe jogajog kora hoini. Bhalo theko, pronam neo Suman. Anything I reminisce about Rothin-da have to start from Pondicherry—yes to that Pondicherry more than half a century back. Today I think it was Mother’s Will that I arrived at Pondicherry with my father Promode Kumar Sen (author of “Sri Aurobindo : Jeebon O Jog”) at that tender age. After 2 nights train journey getting down at Pondicherry railway station early in the morning was a relief. Then Pondicherry was a quite small town still under the French rule. 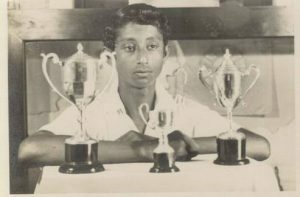 My father was a regular visitor of Pondicherry. Our stay was initially at Red House facing the sea. The next day was Sunday, schools were off. After the morning blessings from the Mother, as we were about to leave Rothin-da ‘caught’ me outside the Ashram gate and asked, “You are Prasenjit? What games do you play?” Learning that I play cricket he took me along to the Tennis ground adjacent where a friendly cricket match was being played by the younger group of Ashram. Rothin-da asked me to be the scorer and I remember the first to bat were Ranju-da and Kittu. Such sweet memories of Rothin-da are many during that stay in early ’50s. Him marching in the play ground in the evenings with C group image is still alive in my memory. Good memories do stay on particularly of the events around the Divine. Then there was a long gap of my coming to the Ashram. However, again the Call reached me in Delhi. That was February Darshan 1968. I was among the streams of visitors entering the Ashram gate. Seated at the entrance was every one’s “Borda” (Tejen-da , Rothin-da’s father ). A few persons ahead of me mumbled something to him to which he perhaps directed them. I simply said to him “I am Prasenjit.” He literally jumped up and embraced me. Time does not erase the etching on the consciousness, I realized an eternal connection and a divine bond . This message reached Rothin-da also and he took me literally in his affectionate fold. The stay was short. But Rothin-da is different. He arranged cycles and I along with a couple of his Ashram friends paddled one evening to a farmhouse ( I guess that was managed by one of his friend Manindra).That outing and adventure inspire me even today when I visit that area of Pondicherry. Changes came in our lives. Rothin-da went to Paris and after a year I too got a German Government Scholarship to study in Mainz, which is located towards the French border. Thus, it was possible to meet Rothin-da again . Luckily there was a French Consulate in Mainz. So my travel to Paris on cheap student excursion trip was easier. In those days an Indian student required visa to enter France from Germany , today it is not. In Paris Rothin-da was a delightful company. He knew Paris like back of his hand. Paris of early 70s was a romantic city. He introduced me to the delicious Crepe of Paris. Since Sonia had not come in his life then, so his spare time was all for me. He had on occasions prepared in his tiny apartment most authentic French cuisines. This affectionate friendship is rare, one may be able trace such stories in the Bengali novels of the last millennium. In course of time life flowed in different courses but our contact was unchanged. I moved in to Bombay. Then one day Rothin-da came with Sonia on their way to Pondicherry. The gateway city Bombay was on their way. We got again together. Sonia and my wife Paula who spoke no French and Sonia hardly spoke English but they talked and talked all through ! 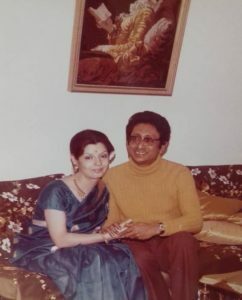 I had no car then but Rothin-da and Sonia sportingly enjoyed the bus ride to savour Bombay duck with soul curry! On their way back we took a domestic midnight flight on Air India to Delhi and they on the same flight further to Paris. Idea was to be together for two hours on the aircraft ! Our visit to Paris was memorable. We landed at Prithwin-da’s place near Orly. Having stayed some time Rothin-da took us, my wife and my son Ruru to Chelles—a quite small town near Paris. He had a magical quality to make friend with the children. My son was averse to the peas in the vegetable. Rothin-da showed him the local peas and told these are petits pois. Ruru agreed and enjoyed a meal of meat balls with petits pois. Incidentally he was a great cook too. He took us for a day trip to the valley of Marne river. He was a wonderful driver too. As one knows the French are vigorous drivers. But Rothin-da, the Ashram trained Driver, was agile and unperturbed amidst the ocean of cars in Paris. A sportsman Rothin-da was also a sportsman in Chelles. He was almost the champion amongst the senior citizens of Chelles in Tennis. My story comes to a sudden end. I was in touch with Rothin-da. But neither there were any more of his home coming nor our trip to Paris. Last time I had been to Paris ,may be in 1998, when I had dropped in to meet Prithwin-da briefly. I regret I could not miss some important meetings and to travel to Chelles to see Rothin-da personally. But no regret, today I find him ever present on my memory tablet which is bright and shining with the Grace of The Mother.